Each September the Funk Heritage Center of Reinhardt University in Waleska joins 1,400 other participating venues nationwide and offers free admission for the annual Smithsonian Magazine Museum Day. Doors will be open free of charge to Smithsonian magazine readers and Smithsonian.com visitors at participating museums and cultural institutions. For this special day, visitors can download a Museum Day Live ticket at Smithsonian.com. Presented by Smithsonian Magazine, this celebration of culture, learning and the dissemination of knowledge reflects the spirit of the magazine, and emulates the free-admission policy of the Smithsonian Institution’s Washington, DC-based properties. Beginning in August, 2018, download a Museum Day ticket at www.smithsonian.com/museumday. Attendees must present the Museum Day Admission Card to gain free entry to participating institutions. Each ticket provides access for two people. Listings and links to all of the participating museums’ can also be found on the website. 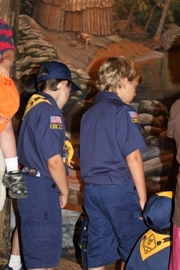 This is a good day for scouts of all ages to visit museums. Free to those with a Museum Day Live ticket, otherwise general admission fees will apply.